very high percentage Quarter Horse and/or Thoroughbred blood. However, Arabian horses are still an outcross accepted by the ApHC. 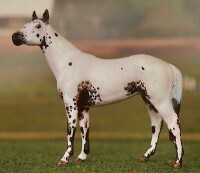 The new rules (2003) allow only colored Appaloosas from the breeding of a registered App to an outcross breed to be registered. Also, as of 2004, the designation of "Foundation bred Appaloosa" has increased the required percentage of Appaloosa blood to 70+% from 50%. This amounts to three of the four grandparents of foal being registered Appaloosas. For regular registration, horses must have either an appaloosa coat pattern or mottled skin, and at least one of the other main characteristics: white sclera or striped hooves. I have concentrated on the blood of the founding Appaloosas, incorporating Money Creek Rockledge (Siri Sheik), Navajo Breeze & Silver Strikes Equal (Mansfield Comanche), Red Eagle's Peacock (Red Eagle), Joker B, Mighty Bright (Bright Eyes Brother), Colida, Prince Plaudit (Red Plaudit), Wapiti, Chief of Fourmile and Ding Bob II. You'll also see some outcrosses. Also, a few of these horses have noted model lines, almost all of which trace to live horses if you take the pedigrees out far enough. Naming rules: Limit of 20 characters~ No numbers, punctuation marks or similarly spelled names~ No naming after famous/notorious people or famous horses~ No vulgar or suggestive names. I'm always pleased when the sire and or dam's name is reflected in the progeny's name. (Doc's Fox [l] x Mighty Misty Blue [l]-Mr Mighty Dell) 4/4. Sire by Doc's Prescription [AQHA]. Sire, OK State Fair Cutting Champion; OK State Fair Heading/Heeling Champion; 1996 Res. National Champion Non-Pro Heading/Heeling. Dam was 1985 Nat'l Champion Saddleseat Pleasure horse, and qualified for World in hunter pleasure and Western pleasure. (Wild Affair x Prairie Magic [l] - Pondie's Leo-AQHA) 4/3+. Sire is double Wapiti, dam is 1/2 QH app. BHR Mr. Conclusion resin, customised by Jamie Coughlin. Champion, MEPSA Reserve Champion, multiple winner in breed and color, IPABRA Champion Sire. Sire of multiple performance winner Wyoming's Wyandot; Wyomings Wyld Pajamas; Multiple Champion Wyoming Bluebell; retired Champion Wyoming Larkspur and winner Wyoming Bluebird, all o/b Persimmon Hill and MMR Wyoming Twister, 09, o/b Debbie Teeselink. Foals: 1991-2005. I'd love foals to carry part of name, but not required. (Princes Fury [®] x Spanish Over [®] QH- Spanish Nick) By son of Prince Plaudit, sire's dam is Skipper W and Nick Shoemaker QH bred. Dam is Skipper W linebred. Lots of Wisecamp QHs in this pedigree. Sire of MMR Skyler's Heart, o/b Debbie Teeselink and Hanhepi-wi, o/b Melissa Addison. Carbonation Celebration New pedigree info! (Festive Occassion [m-phf] x Ruby's Dusty Jewel [m-phf]-Vain Warrior [l]) Both parents on this list. Foundation breeding. Time Flies, Bear Paw, Chief Navajo, Red Eagle. Also Skipper W Quarter Horses through dam's maternal lines. Sire of Reserve Champion and winner Confetti Soiree, Meteor Shower and Pajama Party, all o/b PHF. (Fourmile's Stormy [l] x Joker's Bright Eyes [m-ms] bay blnkt- Joker's Leader [l]) 3+/4+. Sire's side is only 3+ generation because sire's maternal g-dam is a Foundation App from unknown parentage. Have full 4 on the rest. Beside Hall Of Fame Chief Of Fourmile; Joker's Leader to Joker B, Ding Bob and Bright Eyes Brother. Breyer 99 CE 'Chief of Fourmile' OF. Sire of Chief's Revelation, o/b Melissa Henderson. (Joker's Granite Bar [m-phf] x Many Red Horizons [m-phf]- Blueeaglesupreme®) Lines to Joker B., Ulrichs Many Coups, Money Creek Rockledge, Red Eagles Peacock, Bambi E, Bay Bob. Breyer OM SM QHS customised by Sue Sudekum. Sire of Frosted Tacoma, Rock Candy, Graseona, all o/b PHF. (Jetset Gigalo [l] x Leo's Bright Lace [l]- The Executive-Nat'l Ch) Sire was 4th in World Halter, stands 15.3 and threw Pleasure Champions. Dam is a Nat'l Champion Working Cowhorse with ROMs in Reining and Heading and Heeling. Double Dial Good [AQHA], Leo Feast [AAAT]. Breyer SM Citation Sears SR 1998 OF. Sire of Dial N Shine, Jet's Corvette; Bright Eagle; Little Deuce Coupe; Jetstream Flyer and Burning Bright, all o/b PHF. (Dreamfinder [®] x Shados Straw [®]- Ha-Dar Shado) sire WC Dreamfinder, dam has lines to Wapiti, Romans Straw Man, Johnny Dial [QH], Sully B.
Sire of Nekedintheshadows, o/b Jean Soresen and KGs Scallywag, o/b Melissa Addison. (Festive Occasion [m-phf] x Princess Revelation [m-phf]-Prince Shannon [l]) both sire and dam on this list. Stone ISH SR of 180, 'Hot To Trot' OF. IPABRA OF Top Ten Year-End, Reserve Champion OF Stallion (of 178 entries). Get Of Sire winner and Champion. Sire of Conversation Heart and Double Dotted Swiss, o/b PHF. MULTIPLE CHAMPION. MEPSA Champion. MEPSA 2003 CHAMPIONSHIPS TOP TEN. Wins in Breed and Color. Sire of Frost King, o/b Anna Childers. (Bright Domino [m-c.hartung] x Sno Badger Princess [m-c.hartung]- Fair Charles®) Lines to Bright Eyes Brother, Buttons B, twice to Prince Plaudit and Grey Badger II. 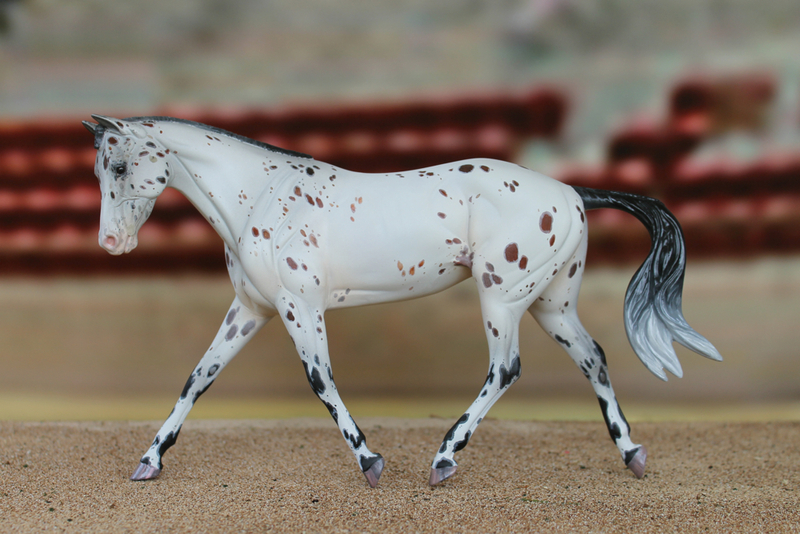 Breyer classic QHS CM by Linda Hardy. Sire of Doc's Velvet Babe, and Badger's Kachina Doll, both o/b Melissa Addison. (Images Moonshine [®] x Sea Freckles [®]- CGR Feathersun) Sire was year-end High Point Western and Western Performance Horse and ApHC World qualified in Halter. Lines to Joker B through Joker's Bill, Bambi E and Patchy Yamini. Dam's sire to Illusion through BBFs Ovation. Lines to Navajo Britches, Siri Spaniard, Red Eagle through Simcoe's Chinook. Dam is CRHA and Sundance 500. SR App performance horse OF. (Scotch Bar Sam [m-h.mays] x Katie Hawk [m-h.mays]- Princes Mighty Mambo) Lines to Zippo Pat Bars, Prince Plaudit, Skip Bright. Good model breeding on damline to Lori Williams program. Breyer QVC LE of 1500 Artist’s Proof ‘Pleasure Horse’ Zippo Pine Bar. Placed in halter and WP. Sire of Ima Secret Zipper, o/b Julia Gronroos and Ima Scotch Penny, o/b Randa Garrett. (Festive Occasion [m-phf] x Butterscotch Confetti®- Choklate Confetti) This guy carries on for his Champion Sire sire. Grandsire is HoF Time Flies, Bear Paw, Chief Navajo, Choklate Confetti, Mulino Cousin, Toby II, Navajo Britches and Patchy. Foundation, TB and sport horse bred. (A And B Stop Sign® x Bluff B Hands [bso-lod]- Joker Hands B Up®) From a sire line of performance Champions! Sire is World Freestyle reining Champion. Paternal grandsire won 54 World and National titles and 315.5 ApHC points in reining, cutting, judged and timed roping, working cow horse, trail and several other events. Paternal g-grandsire was a World Champion Reining horse who also won Halter points. Multiple lines to the great Joker B. Also goes to Hands Up and Mighty Bright. 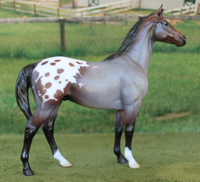 Breyer CM Smart Chic Olena by Jackie Huey. (Mr Rustler Charge [m-phf] x Bahama Mama [®]- Bar Charger) Double Rustler Bill bred, through Rustler Charger. Also carries lines to Absarokee Sunset, Jessie James, Three Bars, Croton Oil, and Go Man Go. Working lines, with speed behind them. IPABRA Supreme Champion (+++) GRAND CHAMPION. Multiple Champion. OFCC National Champion Color, and App breed winner. MEPSA Champion. Qualifed 04/05/06/07. IPABRA 2005 Nat'l Reserve Champion OF Stallion and Top Ten OF Year-End 05. OFCC 07/08 Top Ten Stallion, Appaloosa, App Color, Make and Overall Halter. Sire of Shez Da Bomb and Rustlin Up Da Bomb, both o/b Jean Sorensen, and Okie Hokie, o/b PHF. Foals: 2001-2018. Similar body type foals preferred. (Charlie Cloud [l] x Potpourri [m-phf] TB- Watchstar x Clove- Noble Jay®) Sire is a son of ApHC HoF Hayes Roman Cloud, with Halter and Performance point earners to his credit. Sire's dam is running bred QH. Dam is a Thoroughbred, with race lines and retired CH showhorse. Her sire is a CH showhorse, sire of a race winner, and sire of several Show Champions. 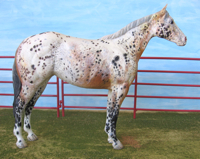 Cloud Chaser is suitable for Appaloosa sport horse breeding. 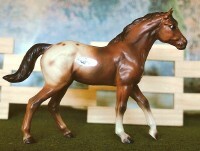 Breyer Classic Terrang CM by Janis Whitcomb. Sire of Aolani, o/b Persimmon Hill. (Copper Key-TB [m-m.arras] x Foxy Freckles [m- m.arras]- Freckles Echo® [QH]) Sire is by Key To The Mint, sire's broodmare sire Affirmed. Dam goes to Colonel Freckles, Doc's Prescription, Wapiti. Great lines. Racing or working, gaming get possible. 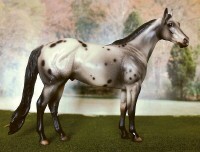 Breyer "Treasure Hunt" 2007 Silver in appaloosa. Sire of Fleetwood Sunfire, o/b PHF. (Hot Ice [m-phf] x Rockalena All Night [m-phf]- Streetlights [m-phf]) Money Creeks Rockledge, Moster's Diamond, Justasample, Santee Apollo, Solar Flair Eclat. Vintage CM Breyer Stock horse stallion. Performance winner and Halter placer. Sire of MMR Majestic Visions, o/b Debbie Teeselink and The Fireman, o/b Hannah Jameson. (Mr Rustler Charge [m-phf] x Eyes High Falutin®- High Sign Nugget) To Rustler Charger, Rustler Bill, Jessie James, Absarokee Sunset, Chief Of Fourmile, High Sign, Top Hat H. Working western lines. Breyer SM QHS JCP 97 SR OF. (All Hands On Zip [live] x Halona [m-phf]- Cherrys Leader [®]) Sire is a leading sire of pleasure performance horses- Western and Huntseat. Zippo Pine Bar sire line, with a line of Champion and Champion producing sires. Also Two Eyed Jack and Foundation App, Hands Up. Dam has great lines to Cherrys Leader, Joker B., Colida and Wapiti. Pam de Muth 'Vaquero' by Dara West. Sire of Shesa Dilly, o/b PHF. (Ima Scotch Zipper [m-phf] x Miss Freckles Plaudit [m-phf]- Colonel Freckles ®) Grandson of Heather Mays' Scotch Bar Sam, by Nat'l CH Skip Go Grand®, and Katie Hawk, with lines to Prince's Jim, Zippo Pine Taylor and Prince David. Dam is a Colonel Freckles® daughter, out of a Prince Plaudit daughter. Linebreeding to Prince Plaudit. Top side carries several generations of well bred models from the programs of Green Mountain, Indigo Creek Stables and Zodiac Stables. Breyer LE 2005 'Impress Me Shanon' Zippo Pine Bar OF. Blackstone [m-k.dodson] x Joker's Bright Eyes [m-k.dodson]- Joker's Leader (r)) Lines to Houston Jet, Chief Dominion Bar, Joker's Leader, Bright Eyes Brother. Sire of Seabird Stone, 08, o/b PHF. (Go Boy Bayfrost [m-phf] x True Blue To You [m-phf]- Snowcap Blue Plaudit [m-c.hartung]) Lines to Go Bay Go, Silver Strike's Equal, Double Six Domino, A Touch Of Blue, Three Chicks Snowcap, and Acclaim. By a sire of a multiple champion. Breyer SM QHS SR 98 JCP. Sire of A Boy Named Sioux, o/b PHF. (Blue Spruce [m-phf] x Joker's Roxseona [m-phf]) Both parents from Persimmmon Hill. Lines to Doc's Fox, Mr Mighty Dell, Joker 3 Bars, Money Creeks Rockledge, Mulino Cousin, Bambi E.
Stone FC OOAK "Just Right Jake" OF. MEPSA Qualified 2013 Reserve Champion. (Dun In Carbon [m-j.sorensen] x Miss Blush Dust [m-j.sorensen]-The Upper Hand®) Lines to Peppy San, Poco Mr Beaver, Skipa Star, The Executive. Dam is a multiple Champion, and has produced a mutliple Champion foal, My Lil' China Boy, o/b Lake Hill Ranch. Stone ISH "Pasty" 2010 OF. (Klines Candy Saiela® x Flicka Feather®- Deacon's Dude) Lines to Navajos Candy, Simcoes Sarcee, Princes Mac, Holy Smoke, Joker B Bold, Deacon's Bonanza, Cooterville Crawfish, Red Clouds Mr Twister. 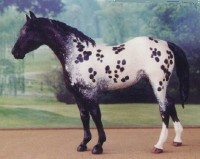 Josef Original china Appaloosa MIJ. Sire of Sweet Sioux, o/b PHF. (Wapiti Super Speck [m-phf] x Mighty Bright Confetti [m-phf]- Mighty Executive®) Lines to Super Weed, Tumbleweed Devil, Wapiti, Hayes Roman Cloud, The Executive, Mighty Bright, Bright Eyes Brother and Top Deck. BHR Mr Conclusion customized by Jamie Coughlin. His multiple Champion sire's replacement in our herd. (Granite Horizon [m-phf] x Lakota Natane [m-phf]- Joker Hands B Up®) Joker B 2x, Money Creeks Rockledge, Ulrich Many Coups 2x, Santee Supreme, Bright Eyes Brother, Prince Plaudit, Chocolate Soda, Ruffs Spot. 3rd and 4th generation doubling of the two noted horses. Meaning foals will be 4th/5th generation, unless the dam contributes more. Old App lines. This guy is one of my very favorite SM scale models- he's just cool. Breyer Premier horse "Latigo" 753 made in 2013. CHAMPION and RESERVE CHAMPION IPABRA, RESERVE CHAMPION MHSA. (High And Mighty [m-phf] x Foxi Comanche [m-phf]- Deep Thought [live]) Sire goes to Mighty Bright, Bright Eyes Brother, High Hand, Tonto Bars Gill, Johnny Dial. Dam is 3/4 TB with lines to Deep South, Rose Time, Fords Commancha Rio, Prince Plaudit, Billie Chicaro, Native Dancer, Stymie, Swoons Son, Bull Lea, Blue Larkspur. Power Steering AR by Michelle Locke Belisle. Winner in gender and breed, plus western performance. (Go Boy Blue [m-phf] x Sioux See Que [m-phf]- Ulrich's Sioux Chief [live]) Sire carries lines to Multiple Champion sire Go Bay Go, Nat'l Grand Champion Halter and Nat'l Champion EP Silver Strike's Equal, Foundation horse Double Six Domino, A Touch Of Blue, Grand Champion Three Chicks Snowcap, and Acclaim. Dam is foundation bred from some of the earliest Apps, with lines to Navajos Candy, ApHC National Cutting Champion, National Champ in Halter & Perf Simcoes Chinook, Kamiak Princess, Toby, Freels Chico. Breyerfest 2018 Dark Horse SR matte leopard App on Smarty Jones, 4000 made. (Daydream Believer [m-phf] x Claymation [m-phf]- First Draft®) Paternal grandson of Dreamfinder, with the illustrious sire line of Alias Smith And Jones, Alias King, Z-Bull. Sire's dam is a late foal from an own daughter of Red Eagle's Peacock. Dam by the first and only Appaloosa son of the great TB, Secretariat, with bottom line to Wapiti, Candys Pondie and Colida. Stone TB extreme app 2016 DAH. Years available: 2017, 2018, 2019. (Roan Valentine [m-c.hartung] x Blue Valentine [m-phf]- Snowcap Blue Plaudit [m-c.hartung]) Nice lines to Royal Redford, King David, Impressive, ApHC Champion A Touch of Blue, Alias King, Dreamfinder. Breyer web special "Scotty" on Swaps in matte App. (Money Creeks Monte-Time [l] x Plaudit's Cherry [m-oma]-Plaudit's Paprika) Sire is by Joker's Monte by Joker B. and sire's dam is by Wapiti. Dam goes to Red Plaudit, Sure Cash, Colorado Sorrel. Photo Show Winner & CHAMPION! MEPSA 2003 CHAMPIONSHIPS TOP TEN. OHFC ROM. Dam of Foxfire Spot On Brilliant, 91, Champion Performance horse, o/b Delana Metcalf; Ultra Blue Bars, 92, o/b Crissi Nickerson; Skipt A Spot, 95, o/b Eileen O'Dell; Wyoming Wyld Pajamas, 97, o/b PHF; Wapiti Star Time, 98, o/b Melissa Henderson; Shez Da Bomb, 02, o/b Jean Sorensen. (Cherry's Leader [l] x Mighty Wapetta [®]- Mighty Dial) Sire line is Joker B., also Chief Apache, Leo, Hard Twist. Dam goes to Mighty Bright, Colida, Wapiti. Dam of Luck N Dreams, 91, o/b Crissi Nickerson; Silverado Zip, 00, o/b PHF and Springwater, 04, o/b PHF. (Hollywood Reedy [m-mbr] x Jokettes Love Bug [m-mbr]- The Love Doctor) Hollywood Jaguar, California Champion Joker 3 Bars, twice to Joker B, Shalako's Plaudit and Roman's Straw Man. Breyer Lady Phase red leopard SR OF. Dam of Senda Dream, 92, o/b Sarah Norini; and Okie Hokie, 06, o/b PHF and Wyoming Twister, 09, o/b PHF. (Straws Topcat [l] x Kachina's Jet [m-fl]-Easy Jet) Sire has lines to Wild Hope- ApHC Racing Hall Of Famer, Johnny Bull, Blazing Vandy and Hayes Roman Cloud. Dam to Jet Deck through Easy Jet, Three Bars, Mahmoud, Man O'War and Poco Bueno. Good racing and working lines. Dam of Kachina Red, 91, o/b Crissi Nickerson; High Country, 94, o/b PHF; Ima Catty Britch, 98, o/b Nikki Byler and Badgers Kachina Doll, 00, o/b Melissa Addison. (Joker Hands B Up [®] x Bright Fancy [®]- Mr Ultra Bright) Great Granddaughter of Joker B. Sire also has lines to Hands Up, Waggoner, Leo. Dam traces to Bright Eyes Brother, Prince Plaudit, Chocolate Soda and Ruff's Spot. 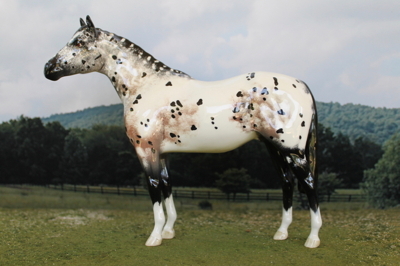 Enesco Appaloosa by Rich Rudish for Hallmark. Multiple CHAMPION. MIJC 2005 Year-End 4th Top Japan point earner 2005 Year-End Reserve Champion Appaloosa. Supreme Champion MIJC, mandatory retirement 2009. Dam of Bright Lakota, 00, o/b Erica Jelen; MMR Lakota Stargazer, 05, o/b Debbie Teeselink; Bright Mesa, 06, o/b PHF and Frosted Tacoma, 07, o/b PHF. (Prince Shannon [l] x Sunspots Revelation [bso-lod]- Sunspot Revel [l]) Sire is by Prince's Jim [Prince Plaudit/Joker B] son, dam is a full sister to Sunspot's Eclipse. Good old breeding. Dam of Holiday Prince, '91, o/b PHF; Chief's Revelation, 95, o/b Melissa Henderson; multiple winner Dalmatia, 98, o/b PHF; Alias Prince, 04, o/b PHF and Seymour Spotz, Champion, 08, o/b PHF. (Easy We Go [live] x Helen Wheels [live]- First Secretary) Sire was a leading race producer. Racing Hall Of Fame SI=98. Dam is a 1984 Hunter Hack ApHC World Champion by Secretariat's first foal and out of a QH mare with lines to Billy Clegg and Norfleet. SM NM TB CM by Janet Bonney. Dam of Wego Faster Sister, 06, o/b PHF. (Jokers Granite Bar [m-phf] x Choclaseona [m-phf]- Mulino Cousin [®]) Joker B, Three Bars, Money Creek Rockledge, Utah Comanche, Mulino Cousin, Bear Paw. Dam of MEPSA Reserve Champion, Roxys Blue Fox, 02, o/b PHF. (Winterhawk [l] x Colida Sunspot [l]-Candy's Plaudit) Sire is a Halter Champion, by AQHA Moore To Run, who goes back to Top Moon, AAAT. Sire's dam is to Chicado and twice to Storm Cloud by Red Eagle. Dam goes to Candy's Pondie, Wapiti, Colida. Breyer Lady Phase customized by. Dam of Wapiti Moon, 93, by Wapiti Super Speck, o/b Monika Stewart; Topaz Wind, 94, NAN TOP TEN, o/b Kathy Dodson; Hanhepi-wi, 03, o/b Melissa Addison and MMR Zips Summer Star, 07, o/b Debbie Teeselink. (Image's Moonshine [l] x Co-Lily [®]- Colida) By a foundation bred App, triple Patchy Yamini, also with the great Colida, Joker B and Bambi E.
Breyer BHR SR IP OF. Dam of Sacajawea, 04, o/b PHF. (Wajo Three Chicks [l] x Dixie Doodle Dandy [m-scr]) Sire is a grandson of both Wapiti and Three Chicks, and a great grandson of Joker B and Ding Bob II. Dam has some grand model lines, including *Alconbury Hill. Dam of Wyoming Wind River, 02, o/b PHF and her replacement, Zip Dixie Chick, by Zip On Down®. (Dreamfinder [l] x Ms American Maid [®]- Jack Justice) Sire is legendary Dreamfinder, dam is by QH Jack Justice, by Two Eyed Jack, with lines to Hard Twist. Stone SR ISH mare 'Ladybug' OF. Dam of Americas Sweetheart, 06, o/b PHF and MMR Shez Justa Dream, 08, o/b Debbie Teeselink. (Mighty One [m-c.hartung] x Jokers Cherry Buzz [m-c.hartung]- A & B Stop Sign ®) Maternal sire is World Champion NRHA Money Earner & 2x’s ROM; also Dial Ten, Prince David, Mighty Tim. Dam of Rustle And Shake, 00, by Mr Rustler Charge, o/b PHF. (Ulrich's Siouxchief [l] x Tobys Dancer [®]- Black Peppers Genesee Chief) Sire and dam both foundation bred. Navajos Candy, Simcoes Chinook, Kamiak Princess, Toby, Freels Chico. Border Fine Arts App mare and foal OF. MEPSA 2002 Championships Reserve Champion; 2003 Top Ten, qualified 03/04. Dam of Prom Queen, 99, o/b Nora Gunderman, Champion Sioux Sequelle, 05, o/b PHF, MMR Heza Sioux Chief, 06, o/b Debbie Teeselink, Sweet Sioux, 08, o/b PHF and A Boy Named Sioux, 2010, o/b PHF. (Streetlights x Rockalena Angel [m-c.hartung]- Solar Flair Eclat®) Sire by Champion Justasample, out of a Hard To Beat mare, with a line to Bambi E. Dam is Foundation bred, with 3 crosses to Chubs Powderface and Money Creek lines. Dam of Hot Night Spot, 00, o/b PHF; Wyoming Onyx, 04, o/b PHF and Speck Of Trouble, 06, o/b PHF. (Stayready Bull [®] x Fine Repute [®]- Roman Jet) Sire by Mr. Spotted Bull.Z Dam is double Hayes Roman Cloud bred, and was a World Champion yearling. Also Top Hat H, Bright Eyes Brother, Depth Charge. Stone SR 'Great American' aka 'One Bright Paige' OF. Dam of Wyoming Bluebird, 06, o/b PHF. (Joker's Granite Bar [m-phf] x Dakota Dilly Dally [m-phf]- Tumbleweed Devil®) Sire is close up to Joker B, Three Bars and Money Creek's Rockledge. Dam by Tumbleweed Devil, with line to High Hand. Older lines. Breyer Indian pony OF . Showing in western performance. MEPSA Western Performance Champion and Reserve Champion- 2015. IPABRA Western Reserve Champion-2014. (Hot Ice [m-phf] x Princess Revelation [m-phf]- Prince Shannon [l]) Sire line to Money Creek's Rockledge, with known Indian Shufflers in the pedigree, and dam has Prince Plaudit, Barretta Bright- HoF producer, Sunspot Revel and Bambi E Foundation lines. 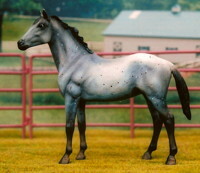 Breyer G2 TB SM CM by Monika Stewart . Multiple winner, Reserve Champion Breed; Reserve Champion Color. (Granite Horizon [m-phf] x Choclaseona [bso-phf]- Mulino Cousin®) Sire on this list, 2 generations Persimmon Hill bred with lines to Joker B., Ulrichs Many Coups, Money Creek Rockledge, Red Eagles Peacock, Bambi E, Bay Bob. Dam was a foundation mare for us, with foundation lines, by Mulino Cousin [l] , out of Santee Angela [l] by Utah's Comanche. (Mardi Gras Party [m-phf] x BBFs Nite Orchid®- NLB Midnite Magic) Lines to QHs Joe Hancock and Grey Badger; TBs Alibhai and Bull Dog, Apps Bambi E and Sully B, Illusion and Money Creek Rockledge. Sire is a Reserve Champion at Halter, and grandsire is a multi-Champion IPABRA sire. Dam of Blue Amber, multiple Champion, 09, o/b PHF and Cattleya Orchid, 10, o/b PHF. (Travel On By [m-b.gustas] x Going Country [m-b.gustas]- Moon Lark ®) Navajo Breeze, Top Moon, Easy We Go. Great racing lines! Dam of an Express winner. Dam of Summertime Blues, 06, o/b PHF. (The Miracle Chip® x Foxfire Miss Pepper [m-d.metcalf]- Navajo Brother) Sire is a Nat'l and World WP Champion, a son of QH Zips Chocolate Chip, World Champion WP horse and leading sire of WP horses. Also, lines to Prince Charles, Bright Eyes Brother, Navajo Britches, Peavy Bimbo, High Hand Man, Mighty Peavy. CM by Art On Fire 2009. MEPSA COLOR CHAMPION 2013; winner gender and workmanship. Dam of Ima Festive Pepper, 07, o/b Twin Springs Stables. (Colida Skipntiwst [live] x Cimarron Sea Babe [live]- Moon Bull) Old foundation and CHRA bloodlines: Dragon Seed, Illusion, Colida, Skip Bright, Siri Spaniard. CM Strapless by Janet Bonney '03. Confetti Occasion [m-phf] x Party Shoes [m-c.nakagawa]- SS Cloak & Dagger [m-m.addison]) Lines to Time Flies, Bear Paw, Johnny Walker, Choklate Confetti, Navajo Britches, Patchy, Quanah’s Warrior, Rock Bottom Red, Riva Ridge [TB], and Bold Bidder [TB]. 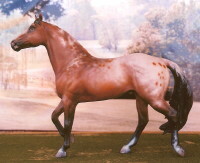 Damsire is a multi-Champion model, and his sire, Mr Silver AAA [live] App, was a Grand Champion halter & top barrel horse. Dam's dam has many TB crosses, and an ApHC race winner close up. CM Strapless by Rita Menard. 5x World Champion,Championships in Western Pleasure, Hunter In Hand & 3X Hunter Under Saddle, Reserve World Champion in Hunter Hack and an excellent sire. Sire lines Zippo Jack Bar, Zippo Pine Bar, Zippo Pat Bars. 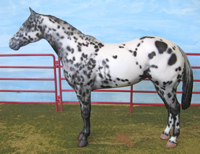 the Appaloosa in the sire line is from Hands Up, an early Foundation registered leading sire of Champions. Dam is 1/2 TB on the damline, with her sire being Appaloosa Scooter Bug G, Racing HoF. 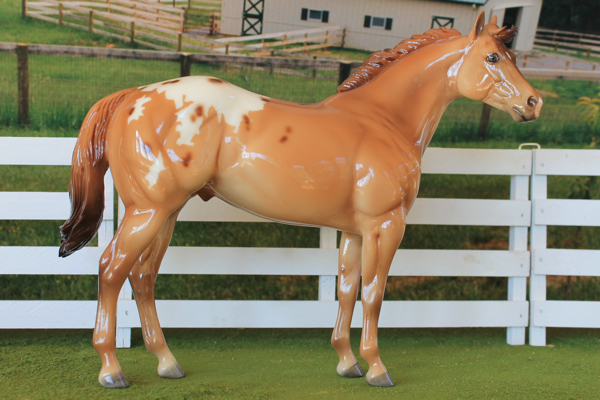 Breyer classic TSC SR "Prince Plaudit" mare. (Harvest Moon [m-l.james] x Winds Of Change II [m-l/james]- Rebel Wind) Sire line to Bold Ruler [TB]- also Native Dancer [TB], Hayes Roman Cloud, Wap's Spot 2, Go Man Go, Count Fleet, Shavano. Apparition is over 1/2 TB blood in the first three generations of her pedigree. (Go Navajo Jet [m-oma] x Peacocks Cloud Power [m-phf]- Hayes Roman Cloud ®) Sire to Easy We Go, Go Man Go, Navajo Breeze. Breyer Silky Sullivan 'Spice' OF. (Silverado Zip [m-phf] x Dakota Dilly Dally- Tumbleweed Devil®) Sire's sire is a leading sire of pleasure performance horses- Western and Huntseat. Zippo Pine Bar sire line, with a line of Champion and Champion producing sires. Also Two Eyed Jack and Foundation App, Hands Up. Sire's damside has great lines to Cherrys Leader, Joker B., Colida and Wapiti. Dam goes to Famous sire Tumbleweed Devil, plus High Hand. Performance and race lines, as well as pretty for Halter through Prince Plaudit. Wire-to-wire Maiden winner first race (Express) as a 3yo. (MA Thunderstorm [live] x Doc Bright September [m-phf]- Ima Bright Doc [m-c.nakagawa]) Working western lines. Sire is a winning Reining horse, with Doc Olena, High Sign, The Continental. Dam has Doc Olena, Scotch Bar Time lines. Stone SR Idaho Spud show "Mattie" OF. Dam of Burning Bright, 12, o/b Persimmon Hill. Showing in Halter and performance. (KSW Matrix [m-r.peavler] x Smart Lil Kandi [m-r.peavler]- Colonel Kandy Bar [live]) Sire is 3/4 TB, his sire is Sunday Silence, and dam traces to What A Pleasure, with App Mr Spotted Bull bequeathing the spots. Dam has QH lines to Colonel Freckles and Smart Lil Question, App lines to Prince Plaudit and Colida. (Muskateer Bar [m-phf[ x Sioux See Que [m-phf]- Ulrich's Sioux Chief [live]) Sire is App and Colorado Rangerbred,with lines to Navajos Candy, Simcoes Sarcee, Princes Mac, Holy Smoke, Joker B Bold, Deacon's Bonanza, Red Clouds Mr Twister. Foundation bred dam, with lines to Navajos Candy, Simcoes Chinook, Kamiak Princess, Toby, Freels Chico. Breyer porcelain "Dances With Wolves" OF. Dam of Cinnamon Girl, 15, o/b PHF. (High And Mighty [m-phf] x Summer Moon [phf]- Winterhawk®) Lines to Mighty Bright, Bright Eyes Brother, High Hand, Tonto Bars Gill, Top Moon, Chicado, Candy's Pondie, Wapiti, Colida. CM Lady Phase by B Morgan, Wildwood Customs. (Snowcap Blue Plaudit [m-c.hartung] x Valentine To A Te [live]- Te's King Of Hearts) Dam's sire if a Champion producer, and sire of Performance horse winners. Lines to A Touch Of Blue, Three Chicks Snowcap, Alias King, Dreamfinder, Te 'N Te, Prince Plaudit, Joker B.
Breyer classic App 'Wild Blue" OF. Dam of Champion Playing With Hearts, 17, o/b PHF. (High And Mighty [m-phf] x Doc Bright September [m-phf]- Ima Bright Doc [m-c.nakagawa]) Dial Bright Too, High Hand, Bright Eyes Brother, Mighty Bright and Peavey Bimbo on sire's side, dam to Doc Olena, Wa-Jo-Re, Skip Bright, Scotch Bar Time, Fairfax Joe and Mr Poco Music. Breyerfest 2013 SR CC Shuffle App. (CTR Chocolate Reign [live] x Lady Magnificent [live]- Solar Flair Eclat) Great foundation and CHR breeding. Zip Drive [m-phf] x Sweet Sioux [m-phf]- Muskateer Bar [m-phf]) Sire is by Scotch Bar Sam from Heather May's Green Mountain Stables. He is a son of Nat'l CH Skip Go Grand®, and Katie Hawk, with lines to Prince's Jim, Zippo Pine Taylor, Prince David, Colonel Freckles, and Prince Plaudit. Dam has lines to Navajos Candy, Simcoes Sarcee, Princes Mac, Joker B Bold, Simcoes Chinook, Kamiak Princess, Toby, Freels Chico. Horse from Leotie and Indian pony set 2008. Hot Ice 1979-2006 black leopard (Money Creek Rockledge [l] x Moster's Diamond [l]-Jet Fire Of AA) Limited pedigree on dam at this time. Dam is a part-Arabian. Breyer Ranch Horse "Hank" OF. MIB, NYS. Sire of Polar Heat, lookalike replacement; Burning Autumn, 2000, o/b PHF, Spring Blizzard, Blue Ice Floe, Siri Spring Diamond, Winter Suns, Snow'n Ice, Holani. Foals: 1983 to 1999, limited book thereafter through 2005. Mr Rustler Charge 1979-2004 black roaned app stallion (Rustler Charger [®] x Absarokee Britches [®]- Absarokee Sunset) By the famous Nat'l Champion Roping and Reining Horse, winner of Open Reining at QH Congress over all breeds plus set a world record for barrels and poles that held up for years. No accident, he was bred that way. By Champion Rustler Bill, who goes back to Peter McCue, and his broodmare sire Jessie Bueno by Jessie James. Dam by Absarokee Sunset, also lines to Chief Of Fourmile, and QHs Leo and Joe Bailey. Breyer SM QHS JCP 97 SR OF. Sire of Rustle And Shake, lookalike son, o/b PHF; Foxfire Spot On Brilliant, Champion performance horse, o/b Delana Metcalf; Ima Catty Britch, o/b Nikki Byler; Itsallinblackandwhite, o/b Erin Logan; and Multiple Champion Atom Bomb, o/b PHF. PHF Checkmate 1979-2006 black, extensive spotted blanket (Money Creek Rockledge [live] x BBFs Chimera [live]- Illusion) double Money Creek's Rockledge bred. Also to Dragon Seed. Breyer Fighting Stallion repaint. retired Reserve Champion. Sire of Trillium, and Orbiter, both o/b PHF. Foals: 1983-2003. Festive Occasion 1981-2007 tri color leopard (Time Flies [l] x Anniversary Maid- Dusty Lake's Ambassador [l] x Maid O'Many Waters [l]- Chief Tahoe) Sire is a HOF racing App, 3/4 TB and SW of $97,250. 36 starts with 26 wins, 8 places and 2 shows. Dam is heavily foundation bred App. She goes to Bear Paw and Chief Navajo. 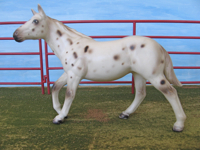 Beswick Appaloosa OF. IPABRA Champion Sire. 4th in breed at IPABRA Nat'ls (only horses with firsts during the year may enter) and 10th in App color. 2005 Top Ten (3rd) OF Sire. 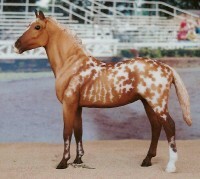 Sire of Champion Appaloosa sporthorses! Qualified for MEPSA Nationals. Sire of: Champion Carbonation Celebration, Reserve Champion & Sire/Get Champion Holiday Prince, Multiple Champion East West Exchange, Reserve Champion Mardi Gras Party, Performance Champion White Tie N Tails, Pa Sybil Magic, Summer Festival o/b Jean Sorensen and Brother Night, o/b Tina McDowell. Foals: 1985-2001. Limited numbers 2002-2008. Prefer similar body type foals, with photo for Get/Sire. Snowcap's Spectrum 1981-2006 black ext.sp.blnk (Three Chicks Snowcap [l] x Moster's Fourmile BB- Chief of Fourmile II) 2+/3+. Three Chicks, Shavano. 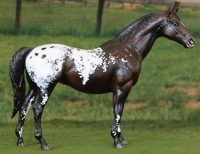 Breyer "Diamonddot Buccaneer" App Perf Horse OF 98. Photo Show winner and Reserve Champion. Sire of Midnight Spectrum, o/b PHF. Foals: 1985-2001. Streetlights 1981-2000 Black spotted blanket (Justasample [l] x Santee Apollo [l]- Hard To Beat) 3+/3+. Chief Joseph Rex, Red Eagle, J&Bs Little Red Rose, Sundance 500. Lots of foundation App breeding. Breyer "Stud Spider" OF. Photo Show Placed. Sire of IPABRA 04 auction ID, Justa Blue Moon, o/b Tracey Bartone; Siri Snowdrift and winners Rockalena All Night and Siri Snowlight, o/b PHF. Foals: 1985-2001. Alias Mirage 1982-2005 black leopard (Alias Smith & Jones [l] few spot leo. x Princess Mirage [l]- Prince Plaudit) 4/3+. Alias Smith & Jones is sire of Alias King, who is sire of Dreamfinder. Sire is 1/2 TB, by Z-Bull. 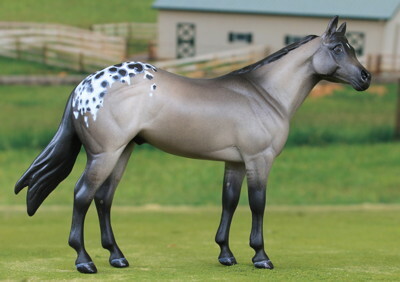 Breyer SM QH stallion OF leopard app. Sire of Alias Snow King, o/b Monika Stewart; Le Champion, o/b Betsy Bissell; and Alias Sweetheart, Alias Pawnee, Alias Prince, all o/b PHF. Foals: 1986-2004. Fancy's Kalata 1984-2014 Black near leopard 1/2 Arabian (Ali Lazi [®] Arabian x Sarcees Fancy [®]- Simcoes Sarcee) Sire to Abu Farwa and Oran, CMK bred. Dam's sire is a Red Eagle descendant, and dam is 1/4 Arabian. 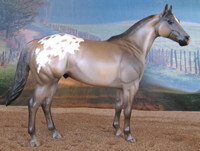 Breyer FAS custom by Ellen White Retired Champion, in both Halter and Performance. Sire of How Now Brown, 95, o/b PHF and Sacajawea, 04, o/b PHF. Foals: 1988-2004. Go Boy Bayfrost 1984-2014 bay with frosted rump (Go Bay Go [l] x Tonee's Sunshine [l]- Skeeter Domino) Sire is famous sire of Goer, etc., and dam is a grandaughter of Double Six Domino. Breyer SM QHS SR 98 JCP. Sire of Go Blue Boy, herd replacement and OFCC Res. Nat'l Champion Foal, Sioux Sequelle, both o/b PHF. Foals: 1988-2004. Wapiti Super Speck 1984-2012 sooty palomino snowflake (Super Weed [l] buck x Wapiti Cloud III [l]-Wapiti) 3/4. also to Hayes Roman Cloud, Three Chicks. Breyer "Clayton" Adios mold OF. Sire of Wapiti Moon, o/b Monika Stewart and Nike, o/b Elizabeth Romano. Foals: 1988-2006. Kingfisher Silver 1985-2008 grulla spotted blanket (Mr Spotted Bull [l] x Equal's Blue Heron [m-phf]-Silver Strike's Equal) Racing lines. Sire is a 1/2 TB Racing Hall Of Fame and sire of many racers; dam is 1/2 QH and 1/4 TB. Dam's sire was a racer with a Mansfield Comanche sire line, and her QH lines include Mr Blackburn, Leo, Chicaro and Oklahoma Star. Stone SR ISH "Coho" OF. Photo show winner. Sire of Zitkala, 88, o/b PHF; Evergreen, 90, o/b PHF and Centennial Silver, o/b Monika Stewart. Foals: 1989-2006. 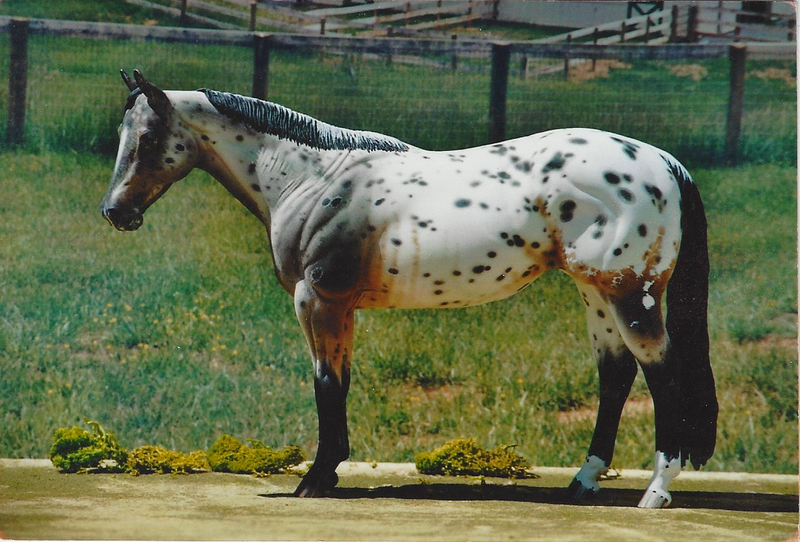 Spot Me Ten 1987-2012 black spotted blanket (Silk Spots [®] x SW Breezin [m-phf]- Navajo Breeze [®]) Sire is an Appaloosa grandson of Silky Sullivan. Dam is by racehorse Navajo Breeze, out of Another Lark [TB] mare. Over 1/2 TB. SM NM stockhorse CM painted & etched. Foals: 1991-2011. Daydream Believer 1988-2014 bay spotted blanket (Dreamfinder [l] bay sp blnkt x Peacock's Sheba-Red Eagles Peacock) 4/4. Z-Bull sire line, sire Dreamfinder is 3/4 QH, 1/8 TB, 1/8 App, while dam is foundation bred App, with TB and Arabian blood. Breyer 99 'Sir Wrangler' OF Photo Show Placed. Sire of Green Day; Passionate Kisses and Sharade's Peacock, all o/b PHF. Foals: 1992-2009. DoublBrightHotScotch 1989-2017 Buckskin with spotted blanket (Bright Pro [l] dun x Little Scotch Sissy [l] QH- buckskin- Little Stringer) 4/4. Bright Eyes Brother/King Plaudit lines. Breyer stock horse stallion OF.Photo Show Placed.Sire of CD Bright Maple, o/b Crissi Nickerson; Bright Idea and Bright Mesa, both o/b PHF. Foals: 1993-2010.